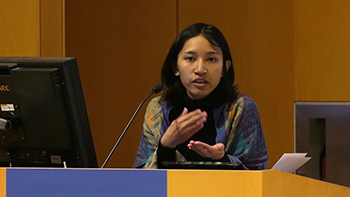 Eaint Thiri Thu never set out to be a human rights activist. She did not like what was happening to minority populations in her country, but it was only when the government pushed to silence her that her anger and stubbornness not to be quieted emerged, along with courage and the sense that what she is meant to do is speak for those without a voice. Thiri visited the United States as part of the Fulbright Visiting Scholar program. More information on Fulbright Scholars can be found at https://www.cies.org/program/core-fulbright-visiting-scholar-program. Q: What happens when people leave their regular routine and comfort zone and find themselves far from home, in foreign places and cultures unknown to them? Each week, 22.33 delivers stories of people finding their way in new surroundings. 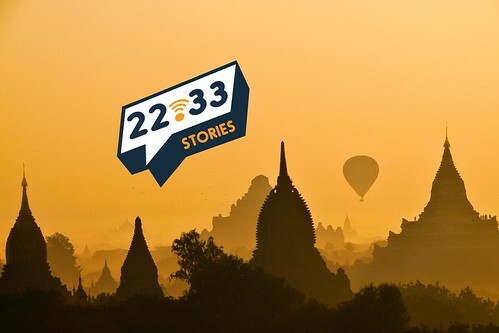 With a combination of travel tales, innovation, empathy, and even survival at times, 22.33 delivers unforgettable first-person stories from people whose lives were changed by international exchange. New episodes are released every Friday, along with regular bonus episodes. Mr. Wurst is from Minnesota and joined the United States Foreign Service in 2002. Before leading the Collaboratory he was Public Affairs Officer in Milan, Italy; Ljubljana, Slovenia; Lusaka, Zambia; Deputy Public Affairs Officer in Chennai, India; and Vice Consul in Guatemala City, Guatemala. He also spent time in Islamabad, Pakistan, giving public affairs assistance to the American Mission following the 2005 earthquake disaster. Mr. Wurst has been awarded one Superior Honor and numerous Meritorious Honor Awards since joining the Foreign Service. In 2007, while in Lusaka, he received the worldwide Public Affairs Award from the President’s Emergency Plan for AIDS Relief (PEPFAR). In 2012, he was nominated as Cultural Expat of the year by Slovenian Times magazine. Mr. Wurst holds a Master’s degree in Education and a Bachelor’s degree in Creative Writing and History from the University of Minnesota, in Minneapolis. He also studied literature at Birmingham University in England. Prior to joining the Foreign Service, he was a high school history and literature teacher, in Minnesota and South Africa. Mr. Wurst has had a variety of writing jobs, including contributing scriptwriter for Mystery Science Theater 3000, a nationally televised comedy program. As a photographer, Mr. Wurst has had exhibitions in four different countries and has published numerous photographs. Mr. Wurst is married to Kjara Wurst, a Slovenian choreographer.